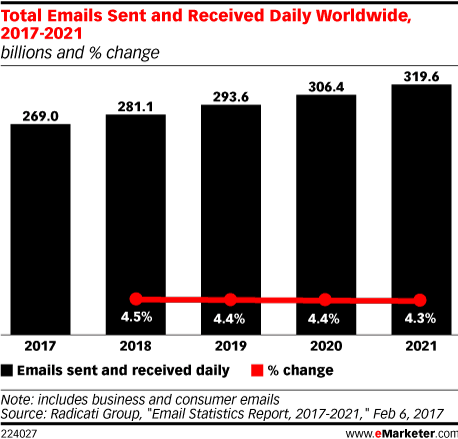 Data is from the February 2017 Radicati Group "Email Statistics Report, 2017-2021." Projections are based on information from their worldwide database, which tracks enterprise adoption, IT users, seat count and user population from 1993 onwards; surveys conducted on an ongoing basis in all market areas they cover; and customer demand information, market share, revenue and sales derived from vendor briefings. Secondary sources are also used and include company annual reports and other financial disclosures, industry trade association material, published government statistics and other published sources.